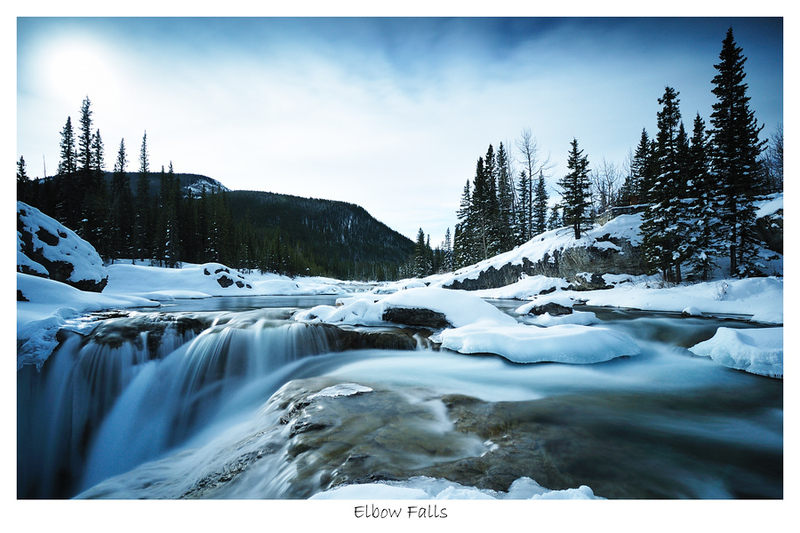 On the last day of the year drove out to Troll Falls near the Kananaskis Village. I haven't been out there forever, opting for newer locations with different views. The falls are tucked away in the shadows and sometimes the light is challenging because the sky is usually so much brighter than the water. 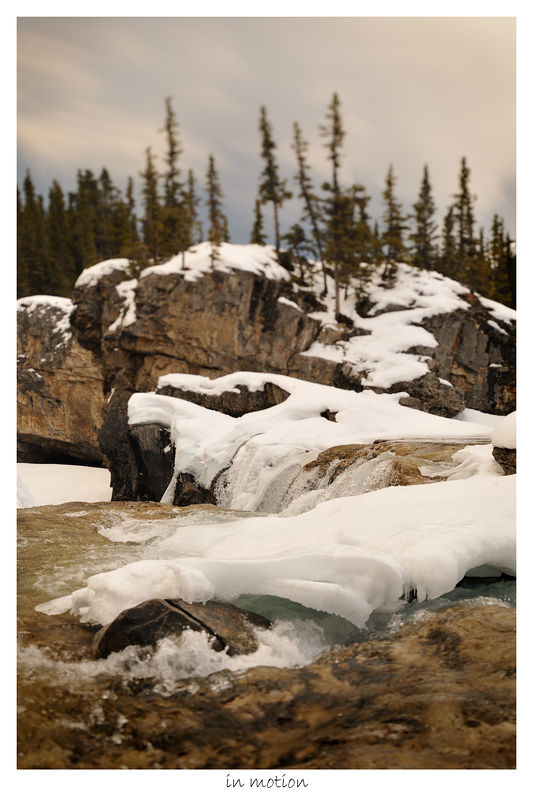 There wasn't a lot of snow on the trails leading to the falls so the walk, while refreshing, was somewhat uneventful. It was nice to be outside moving around. The falls themselves were iced up, but the ice wasn`t very thick. 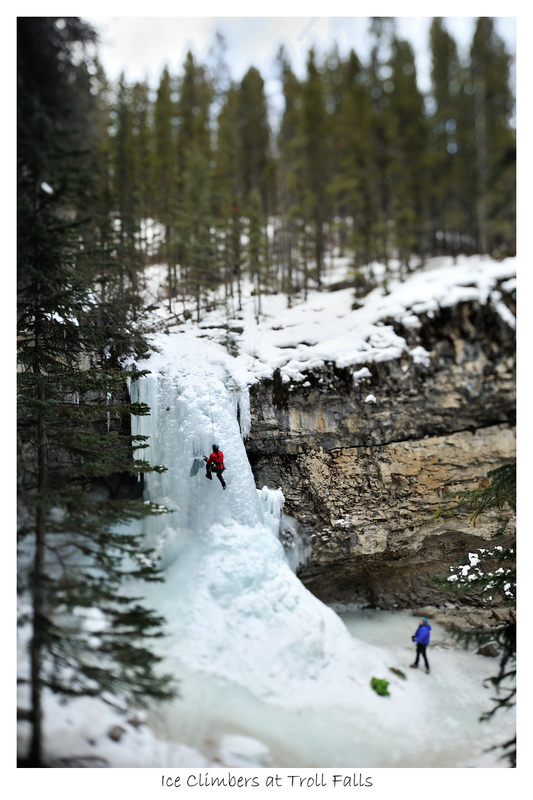 There were a couple of ice climbers picking their way up the falls which was kind of neat to see. It didn't take them long to climb up and back down again. I snapped a couple of shots with the tilt-shift lens trying to use selective focus to highlight the climber. Walking back to the car it was starting to get late. The sun would be setting soon so I drove down to the Kananaskis lakes to see there there would be a colourful sunset. On the shores of the Lower lake the wind was howling and the sun had moved behind a cloud bank. I tried to get a few shots but it was quite windy and I didn't want to walk very far so I left there and drove over to the Upper lake parking lot. Instead of a colourful sunset, I found snow. Sun rises late now - after 8:00am. I was having a coffee and asked Google if anyone had seen any owls near Calgary. This eventually led me to a birding site where someone had claimed to have seen a Snowy Owl a couple of days ago. I figured I should go look because it wasn`t far from my house. I drove out east to Highway 9 then south towards Langdon. I didn't really see much and was getting a bit discouraged. The car was telling me that I was running low on gas so I started to head back towards home. I still kept to the back roads - looking for owls - when the air started to fog up with ice crystals. 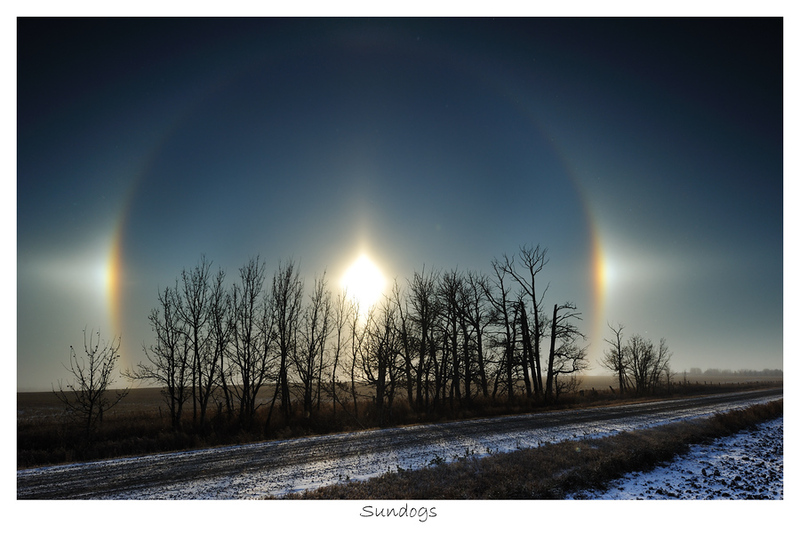 I noticed a pretty nice sundog around the sun so I stopped to take a few shots. It was pretty chilly out at -22degC so I wasn`t out of the car for long. I like how the trees make shadows on the road and the texture of the dirt and the snow. I used a two stop hard graduated filter and a three stop soft grad to help darken the sky so there would still be some detail on the road. Peeking out the window this morning at 6:30 I saw that the sky was mostly clear after week of rain and nondescript cloud. There were some light clouds in the east and I thought maybe the rising sun would catch them and they'd light up real nice. I checked to see what time the sun was going to rise today (7:48am) and figured I still had enough time for toast. When I did leave the house there was a nice orange band of colour along the horizon and the clouds were just starting to show some pink. I was hopeful. I drove east to the same location as last weekend because I thought maybe this time the clouds and colour would let me use the trees in the composition. I had this thought of being low in front of the line of trees with them receding into the background, the sky above rich with colourful clouds. When I got to the field it looked like the clouds were going to end up blowing past the trees and probably wouldn`t catch the light the way I'd hoped. Walking into the ditch so I could get access to the field and see what the composition would look like I was struck by this tall grass against the gradient in the sky.. Actually what struck me first was the red and yellow hues in the leaves of the tall grass, but I didn`t think I could make a meaningful photo given how much light there was. 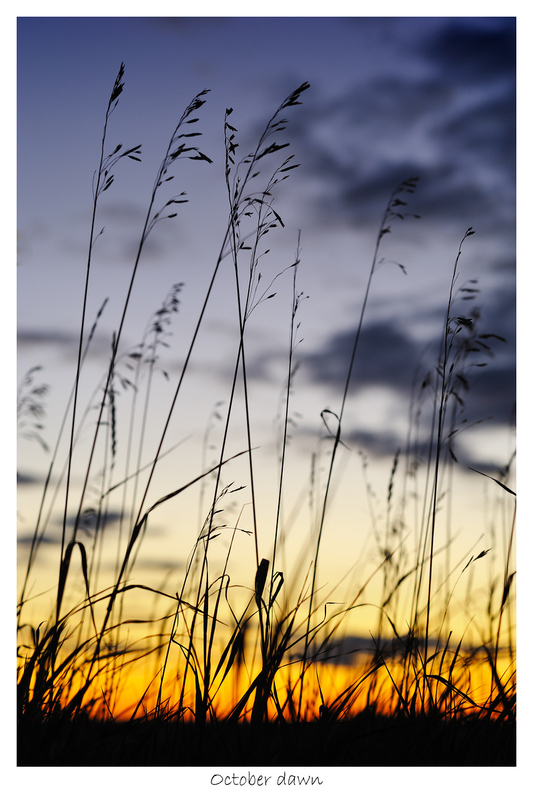 That`s when I became distracted with how the grass was silhouetted against the sky and that's what I ended up shooting. I never did make it into the field where the trees are. I guess I`ll have to try again some day. I made a few other shots of the sunrise, and if I end up posting any, you'll find them here. 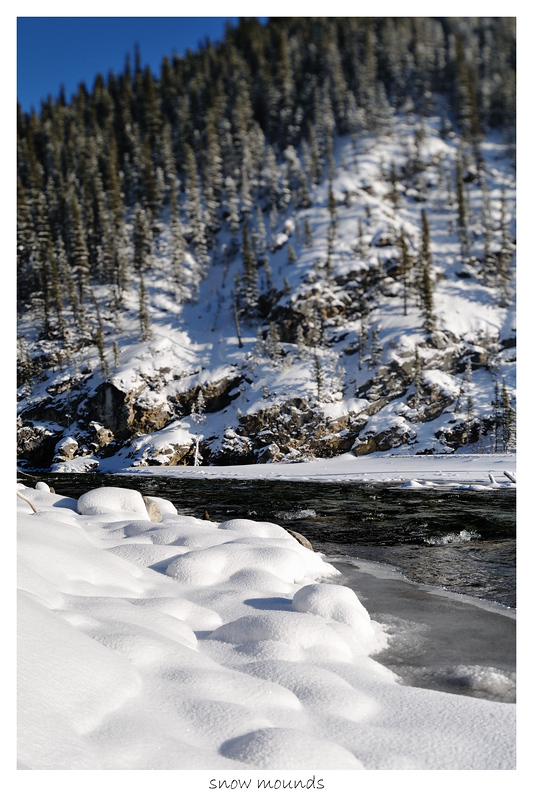 On Friday afternoon I drove out to Powderface and walked along Prairie Creek. It has been cool and raining all week and I was hopeful that the leaves in the forest were still on the trees and hadn't all been blown off by the wind. There was a light rain when I got to the parking lot. The sky was grey and overcast with almost no wind. I love walking through the forest when it's like this. It's so calm and peaceful. 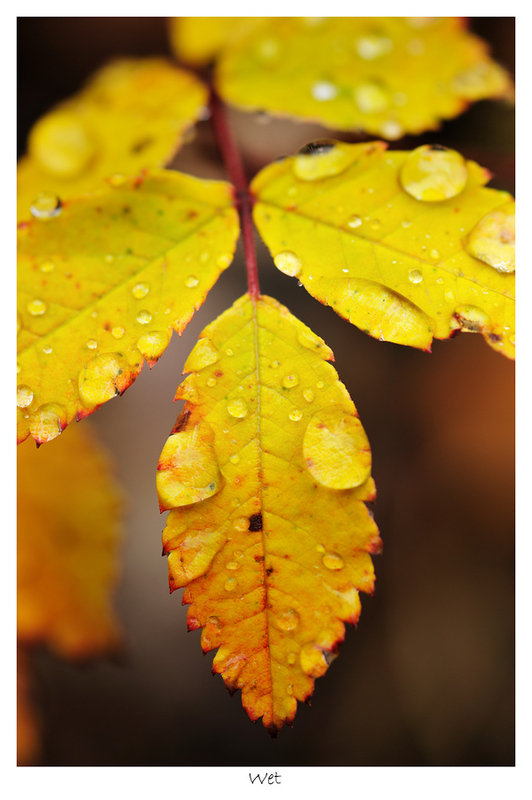 I`m intrigued when water droplets form on flowers and leaves like little spherical jewels. I really love it when the leaves have turned yellow and are edged in a nice deep red colour. I was fortunate to be standing in a forest with an infinite number of opportunities because everything was wet and yellow and red and orange. I was driving home from work, the sky was overcast with high thin clouds but the sun was low and there was some muted colour. I was heading north on Deerfoot from Memorial drive and it looked like the sun was directly behind the buildings downtown. When I saw what was happening I imagined shooting the skyline silhouetted against the colourful sky with the sun directly behind the buildings. I often get the impulse to stop and take a photo but more often than not I just keep on driving. Tonight I circled back to a spot that overlooks Bridgeland and has a pretty good view of downtown. When I first got there I could see light spilling around the Bow. I quickly took a couple shots because I didn`t want to lose the opportunity before it went away. It did not last long before the sun moved and the light changed. This shot wasn't quite what I originally had in mind but the sunlight spilling around the building is quite nice. Sometimes you get more than you asked for. The little black specs are birds that were flying across the scene. I waited a little while for them to pass but they just kept on coming. Took a short drive on Sunday afternoon to try and capture some fall colours before they disappear. I was hoping to get back to Highway 40 because the trees all looked pretty spectacular on Saturday when Conor and I drove out to King Creek Ridge. I left Calgary and drove west on the 1A towards the mountains. Without any real destination, I decided to stop at Mt. Yamnuska. 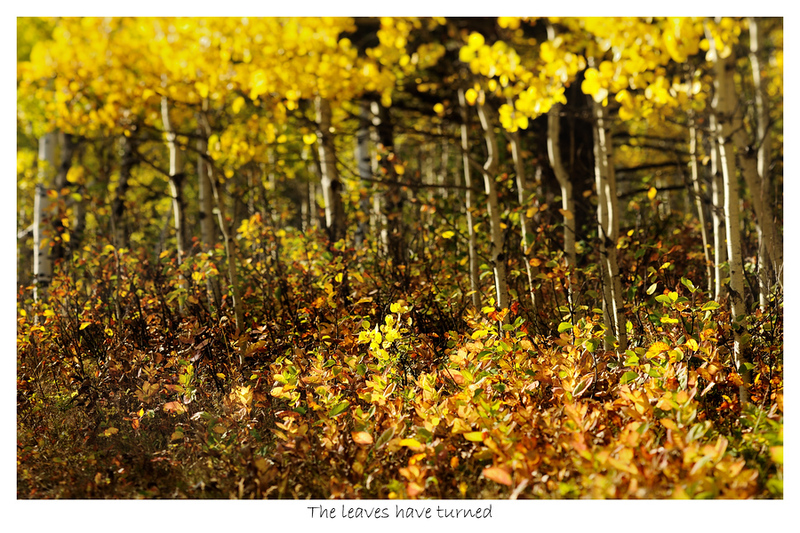 I wanted to find a place where there were lots of deciduous trees and at Yamnuska the trail winds through a nice aspen forest before it starts to climb. I kind of thought I would spend a bit of time there then hop on over to Highway 40 and see what else I could find. This first shot is a bit busy, but I think it works in terms of showing off the colours. I like the reds and browns in this photo. I got up early on Saturday to try and shoot the sunrise. I'd seen too many nice sunrises through my rear-view mirror when driving in to work this week and I wanted a chance to try and catch the light. There is a line of trees east of the city in a field that I thought would make a nice foreground object if the sky did catch fire. So I headed out there. As it turned out the colour stayed in the east and the whole sky didn't catch the whole sky the way I had hoped it would. I swapped my wide angle lens to the telephoto and tried to fill the frame with colour by zooming into the horizon. This first shot was well before the sun reached the horizon. There were some nice blue and orange hues. There isn't really much for foreground interest in the flat prairie so I tend to use power poles and wires to provide some interest. I was chatting with a guy at the camera store and our conversation turned to birds and he mentioned Frank Lake which is just east of High River. He told me that he'd been down there and had seen a bunch of short eared owls. This piqued my interest so I did a bit of research on it and found out that it's a Ducks Unlimited Wetland project and is one of 597 important bird areas in Canada, and there are owls there. Given that it wasn't real far away I drove down on a Friday afternoon to check it out. I really didn't know what to expect. The weather was grey and overcast, and reasonably cold. There wasn't anyone around when I got there. For the most part there were Geese and Ducks. I did see a hawk being chased by some gulls. Later while walking through a field three short eared owls (short eared owls are ground dwellers) flushed out of the grass and flew away. They were opposite the direction that I was looking when I disturbed them so by the time I noticed them they were already quite far away. I took some shots, but the owls were too small in the frame. 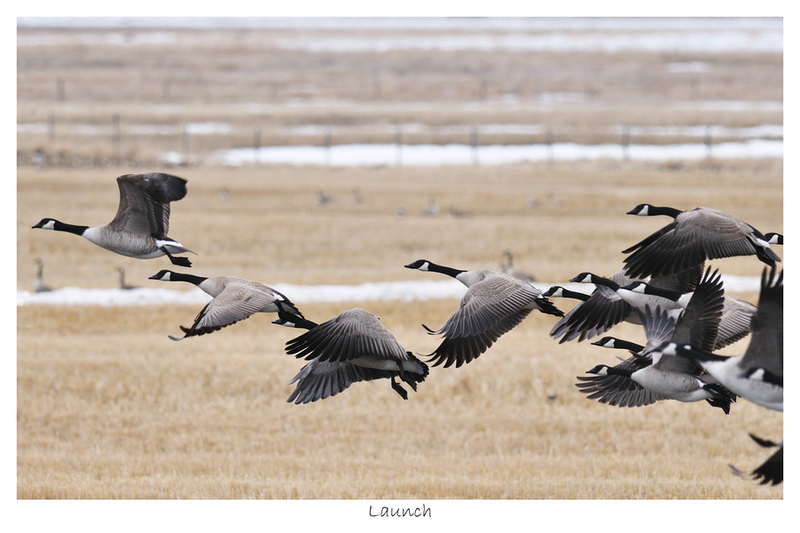 I did get a shot of some geese that I like.. There were lots of geese. LOTS. Anyway, I'll have to go back out once it warms up, maybe bring the kayak.. I wonder if there are rules about not using the kayak on the lake. I'll have to investigate. I took an excursion to the Bird Sanctuary at lunch for a short walk and to see if there were any birds. The pathway through the sanctuary is a loop and in the summer time when the leaves are out its really quite enclosed and you can't see very much. I didn't have much luck spotting anything extraordinary there were the regulars - ducks and geese, and I saw a cedar waxwing but he was small and high up in the trees. 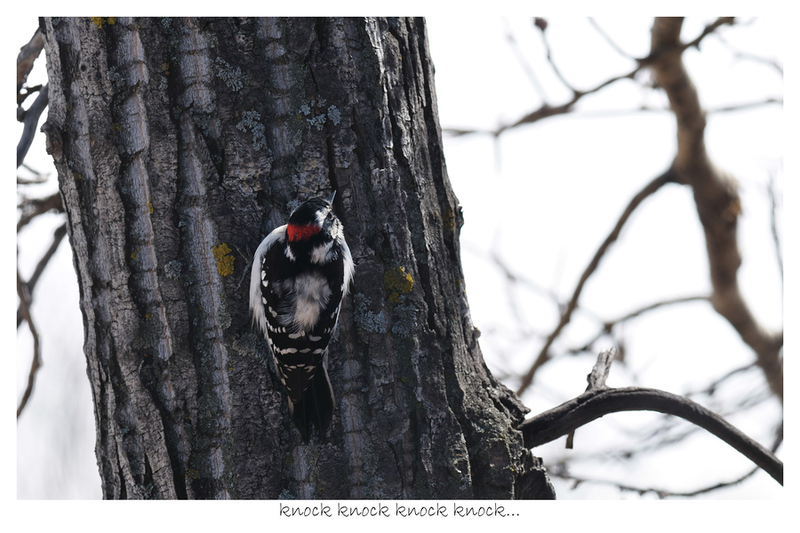 Towards the end of the walk I came across a woodpecker. It was cool because I could hear him knocking well before I saw him. I got a few shots but many didn't turn out because he generally kept to the shady side. After a while he had moved off and I had to get back to work. I was out at Beaver Flats last night and had a good time walking along the ponds and taking pictures of the running water. When I was looking at the shots that I got I felt that they were missing something. Then I realized that they were lacking definition and depth that direct sunlight would help provide. So, I thought if the weather held up that I`d try to go out again tonight. With that in mind, on the way into work driving across the Center street bridge I was struck by the nice morning light so I opened up the sunroof and stuck the camera out and was able to get this shot. That evening at Beaver Flats I walked along the river and there was lots of beautiful light. I took a variety of shots using different tools to try and create some nice effects. On this shot, I used the tilt-shift lens to vari the focal plane. I hope you like it. To see other shots from today, click here. I drove out to Grotto Canyon for a day trip. 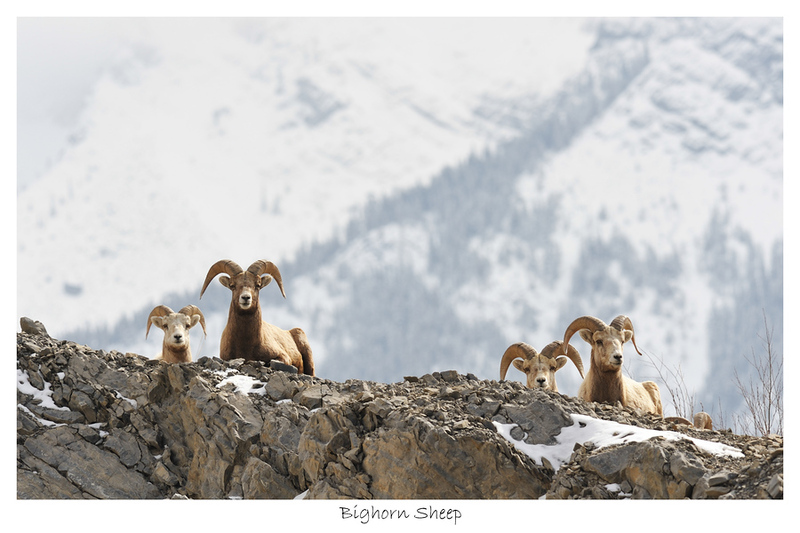 On the way there the bighorn sheep were resting on a hillside just past Exshaw. I stopped to take some shots and a guy coming from the other direction asked if I had a camera. I said yes and he said I should go ahead a little further and look back because the sheep were all lying on top of the hill and I'd be able to get a good view. I like how the mountain in the background forms a nice backdrop for the sheep. 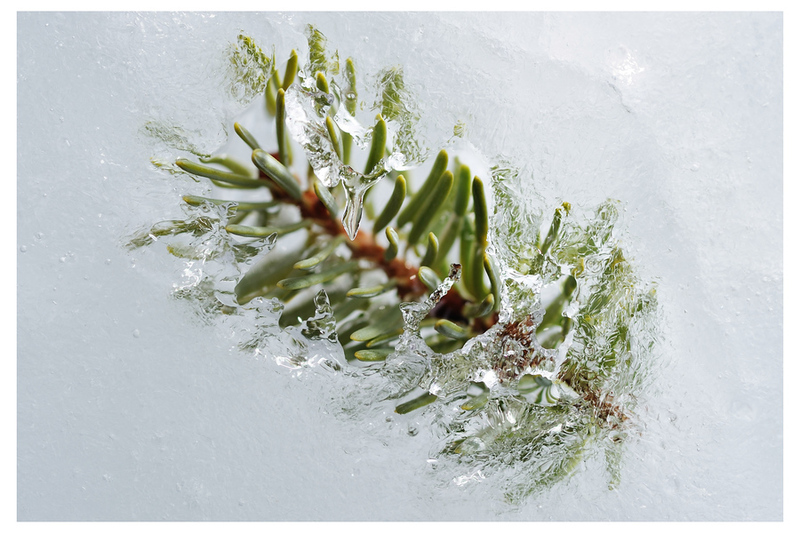 After getting to Grotto Canyon I walked along and looked for something to shoot and found this pine cone encased in the ice. A few years ago I shot a leaf on snow and used a flash to push some light across the top of it. I liked the effect so when I see opportunites I try to bring out the flash to add some depth. I used the macro lens here to get nice and close. Towards the end of the main trail the ice-fall hadn't melted off yet. Exploring it I discovered there was a cavity in behind. I used the flash to help brighten up the shadows and stuck the camera in to the hole pointed straight up. I wasn't able to look through the viewfinder to compose the shots so I would take a shot then review it on the back of the camera and try again. I had to continuously wipe water off of the lens but in the mess of shots I was able to find one that had an interesting composition. 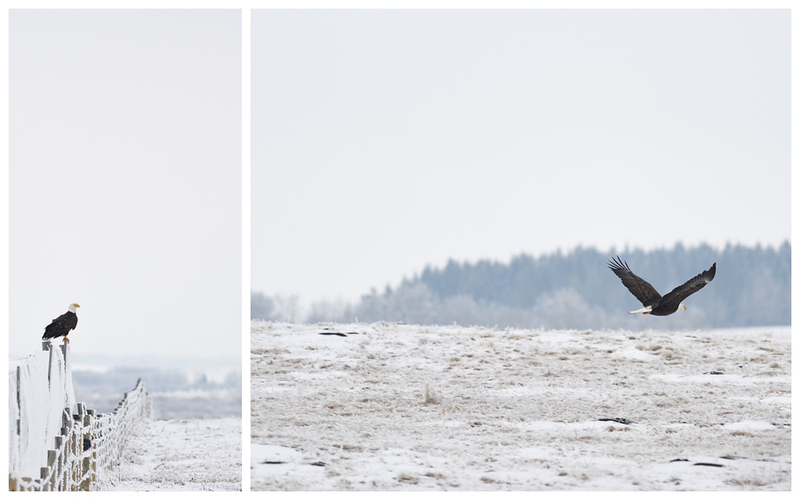 While driving home, I saw a bald eagle flying across the landscape.. I pulled over near the weigh station and watched it for a few seconds but it was flying the other way. Further down the highway I turned off on Jumping Pound Ridge road and was driving along when I found this guy. He'd landed on the fence so I stopped the car and tried to get a few shots. After a few seconds he flew off. I was happy to see the bald eagle up close-ish and get a couple of pics.. They`re migrating through and I don`t think will be here for long. To see more shots from today, click here. We've had a lot of foggy, frosty days here the last while. I`m surprised at how long it`s been hanging around. 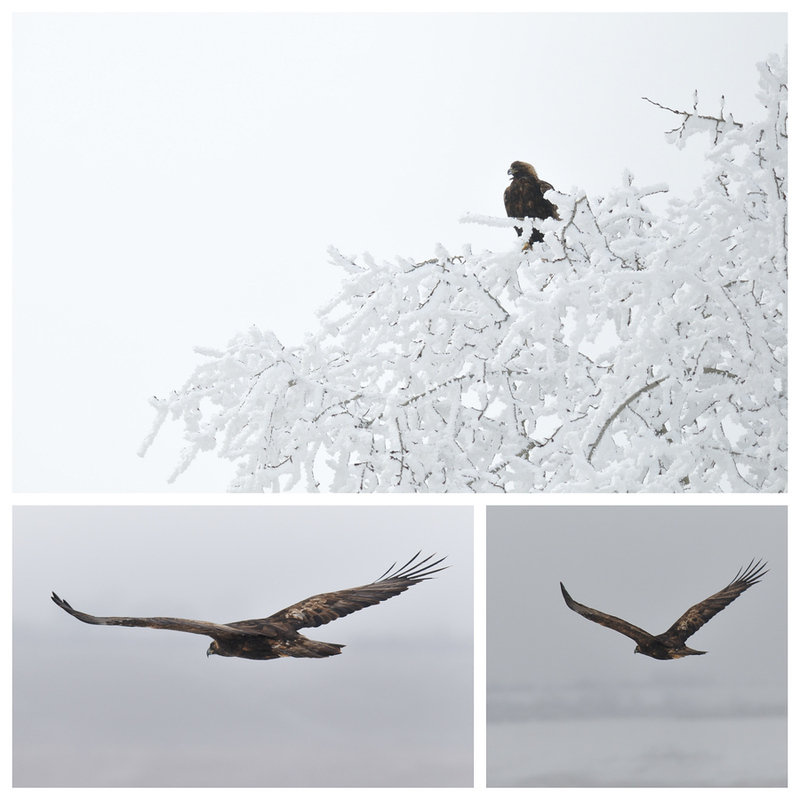 I was driving out past Cochrane looking for bald eagles as they've been migrating through the area. I'd seen lots and lots of opportunities to photograph the fog and the frost but it's hard to pick a spot when you're driving down the highway. Oftentimes I`ve seen a scene that moves me but I`ve already passed it and the decision to stop and turn around gnaws at me. Almost always - I don`t stop. I have a catalog of potential shots that I missed because I didn`t stop. Next time, I think. Next time I`ll stop. Next time the light and the fog and the frosted trees look like that I`ll stop and make that photo. Until then, they`ll just be my private memories. In reality, the moments are fleeting, there most likely isn`t going to be a next time. I drive myself crazy thinking I need to capture everything I see because I`m just overwhelmed with the beauty of it all. 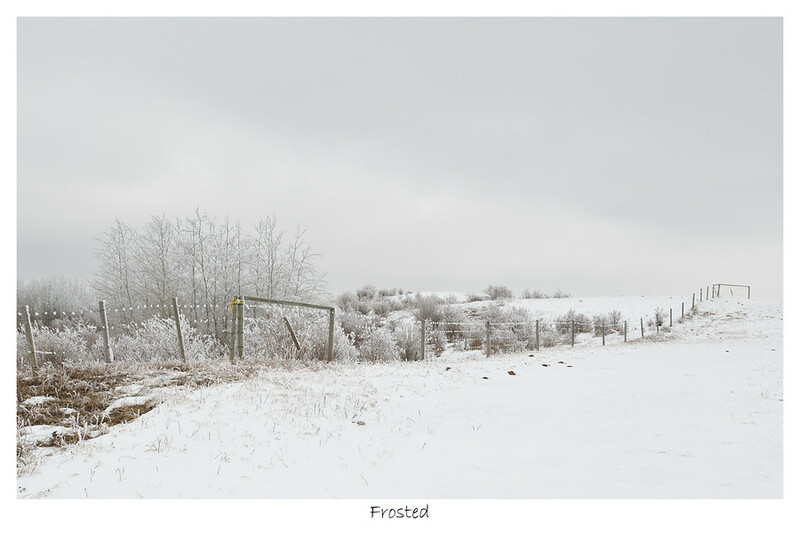 Here, I did stop - walked across the highway and tried to compose a shot of the frost and the fog. I like how the curves of the hills rest against the sky and the curve of the fence cuts across the frame. Not much later, I was driving down another road in the area and came across this guy in the top of the tree. I stopped just past him and got out of the car and took a few shots before he decided that he`d had enough of me and flew off into the distance. I was able to get a couple of shots of him in flight. When he was lower to the ground I was impressed at how big he was. Later, looking on the internet to find out if it was a juvenile bald eagle or something else, I discovered that he might have been a golden eagle because of the light brown patch on the back of his head. I don`t know about you, but I`m impressed. After finishing up with the hockey games earlier in the day I took a short detour on the way home. Actually, the hockey rink is just down the street so from a detour perspective I guess I really went on a short drive. I was on a road just east of the city looking for birds when I came across a field where there was a fair bit of activity going on. I think there were at least two owls flying around and maybe a hawk or falcon it was hard to tell. 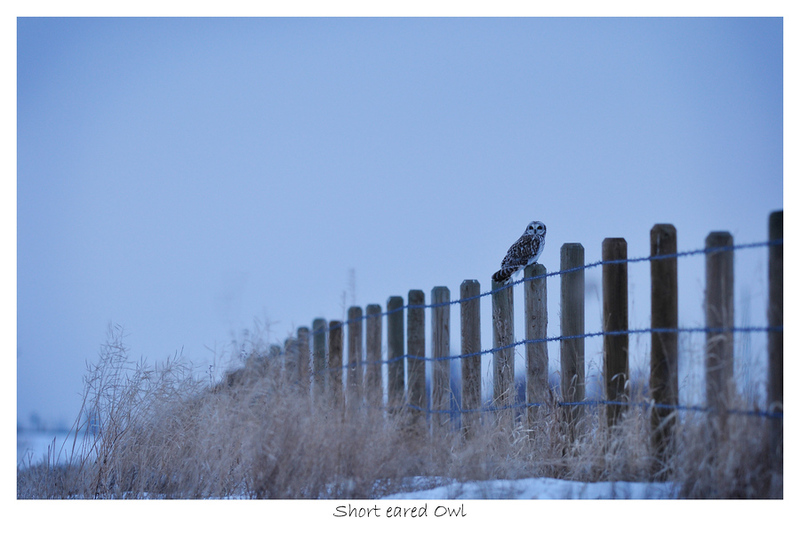 I stopped the car and walked into the field to see if I could get close to the owls but didn't have much luck. Soon they were all flying far away from where I was so I left. I figured that I`d found an area where they might be nesting. Later that evening I thought I'd go back and see if I could find the owls again. So I drove to the same location parked and made my way into the field. I was moving slowly, trying to be quiet. I had my camera, tripod and the remote release because it was reasonably dark and I wouldn't be able to hand hold the camera to make a shot. While I was walking an owl flew up from the ground quite a ways in front of me and landed on the ground again. I took a couple of shots and then tried to move closer. He saw me and flew to a fence post. I followed him taking a few shots then walking about 20 paces and taking a few more. When I got too close he would fly away and land on another fence post further down. This is as close as I could get. Soon it was too dark for any more photos so I made my way back to the car. I drove down the road a little ways to see if the owl was still around and found him flying low above the fields. I watched him for a while until I lost sight of him in the darkness. The final game of the tournament and PSA won 4-3 in a pretty exciting game. I would like to thank the team for letting me take pictures from the bench, I appreciate the opportunity. 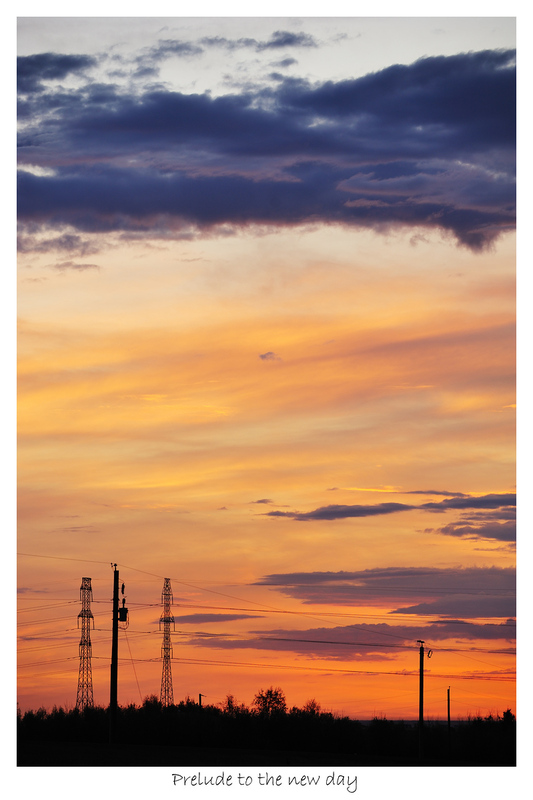 Click on the photo below to see the gallery. Matthew's team was scheduled to play two games today - one at 9:00 am, the second at 3:15pm. The 9:00 game was against Crowfoot which turned out to be a physical game. A lot more hitting than I saw at the two games I've seen recently. I was wondering if body checking was frowned upon at this level before I saw this game. There were lots of hits and, as a result, lots of penalties. Unfortunately PSA wasn't able to beat Crowfoot. It was close with PSA giving up an empty netter in the last minute. The final score was 3-1. Because Crowfoot won the game, these two teams will meet up again at 3:15pm. Should be a good one. Meanwhile, click on the photo below to see the gallery. Look closely, everyone is looking at the puck - can you see it ? 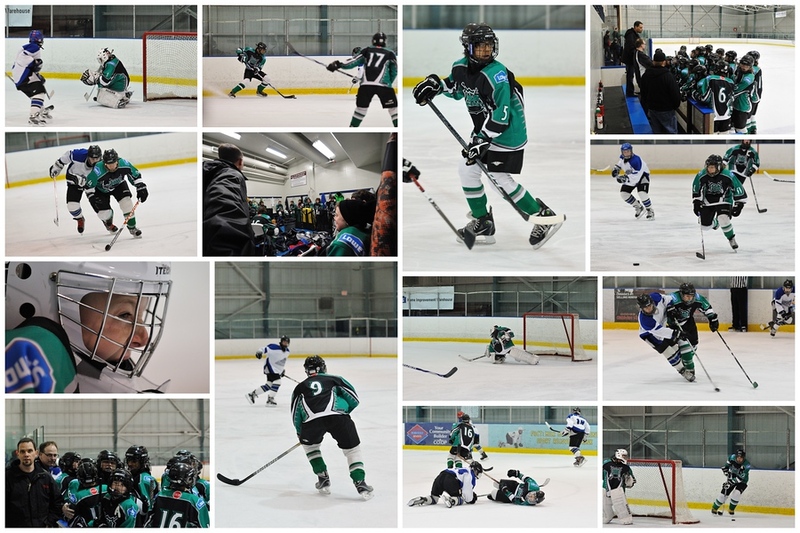 I was invited to shoot photos at my nephews hockey game again on Saturday. They were able to pull off a 3-1 victory over the Lake Bonavista Breakers. Click on the picture to go to the gallery. After parking the car on my way to work this morning I stepped out onto the street and was stopped by the morning light streaming down 9th avenue. 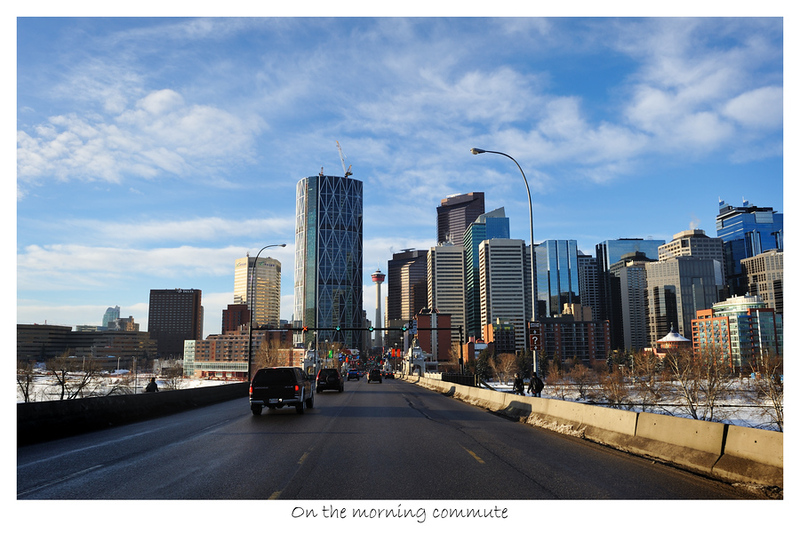 I hesitated with indecision - go get my camera from the car or head up to work. I decide to go get the camera from my car and try to get a couple of pictures. I should have taken the stairs cause the elevator took forever to come. Then the doors didn't open quick enough, once they did open I got in and pushed the button for the floor and now the doors wouldn't close.. I was cursing the doors and urging the elevator to hurry up. A person walking through the elevator lobby looked at me funny, but when the light is there, its there - and it usually isn't there for very long so I was in a desperate hurry. Eventually I got the camera and made my way back to the street. 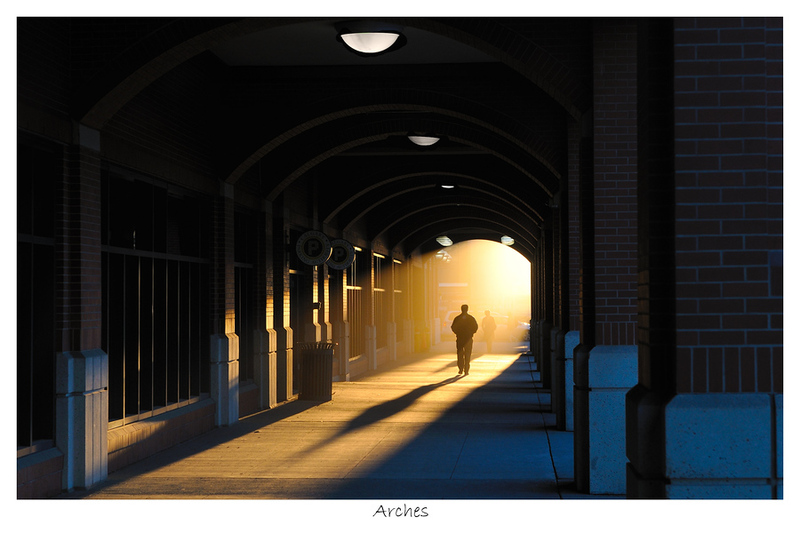 The sun had moved off of where I first saw it but I noticed the light pouring in under the arches above the sidewalk. The air was heavy with dust from the road. I waited for some pedestrians to walk into the sunbeam and took some shots. 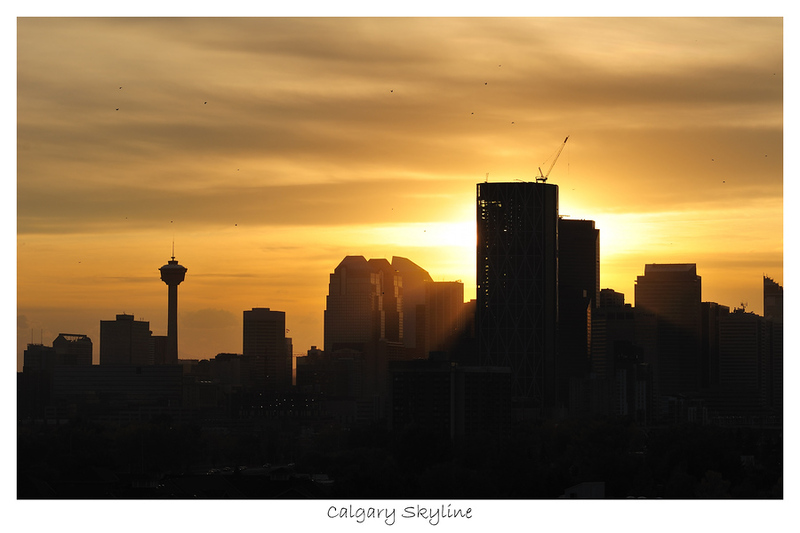 I'd booked the day off work to volunteer at Conor's school field trip to Fort Calgary but that wasn't happening until later in the morning so I thought I'd go out and see what the sunrise was going to do. 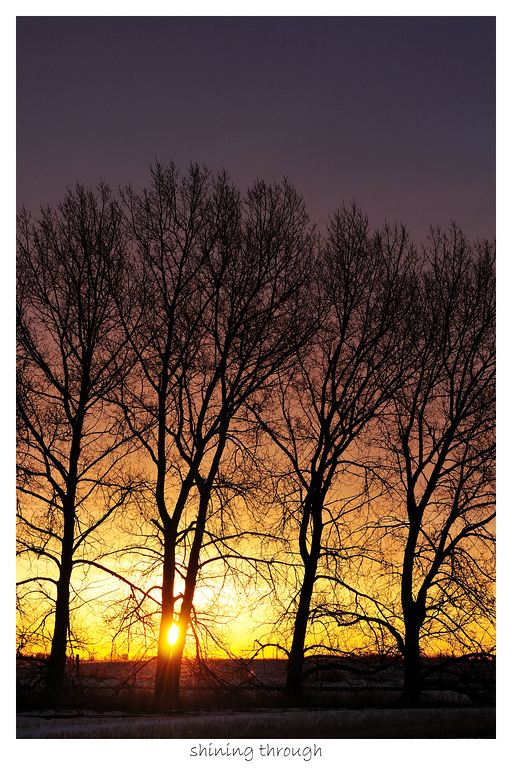 With daylight savings time in effect the sunrise is suppose to happen around 8:00am or so. I left the house around 7:30 and started driving out east of the city again. I stopped the car on Garden Road near Conrich and got out the tripod and cable release. 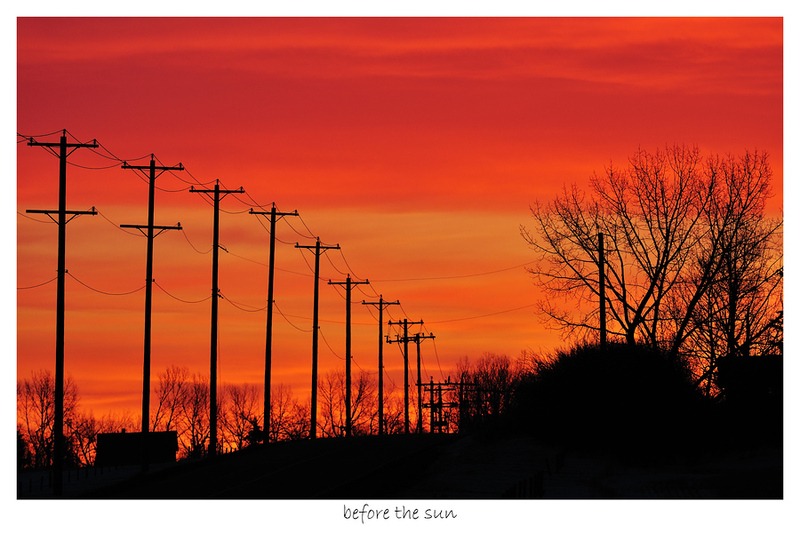 The sky was on fire I wanted to compress the line of telephone poles and fill the frame with the colour on the horizon so I used my 300mm lens. 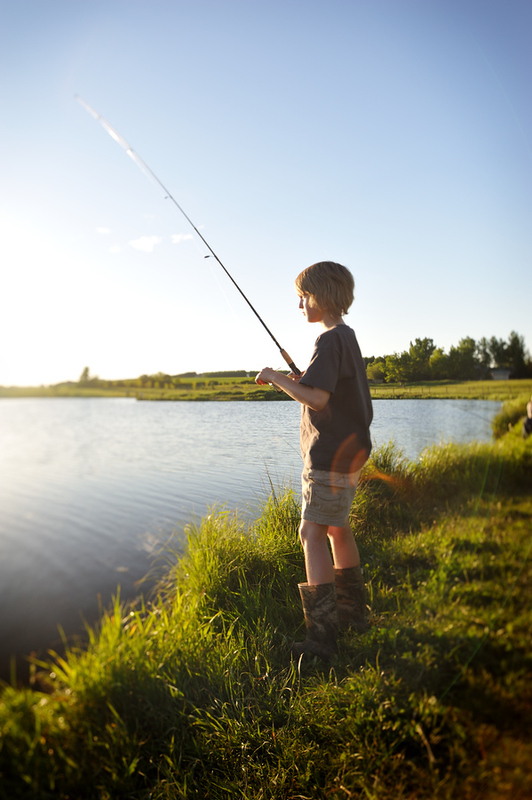 Using a long focal length, the camera is susceptible to any kind of motion so the tripod was necessary. I used the mirror lockup function - which raises the mirror on the first shutter release and takes the picture on the second shutter release and then lowers the mirror. To reduce the vibrations of the mirror slapping up and down you raise the mirror wait for five or ten seconds then take the picture. I use a cable attached to the camera to work the shutter so that I'm not touching anything. This is the photo that I was able to get. 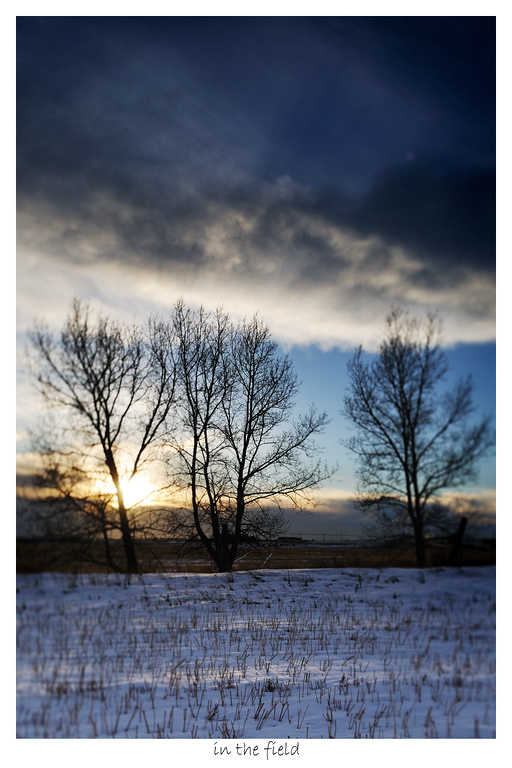 Out on some back roads I tried to find something interesting to shoot as the sun was breaking the horizon. 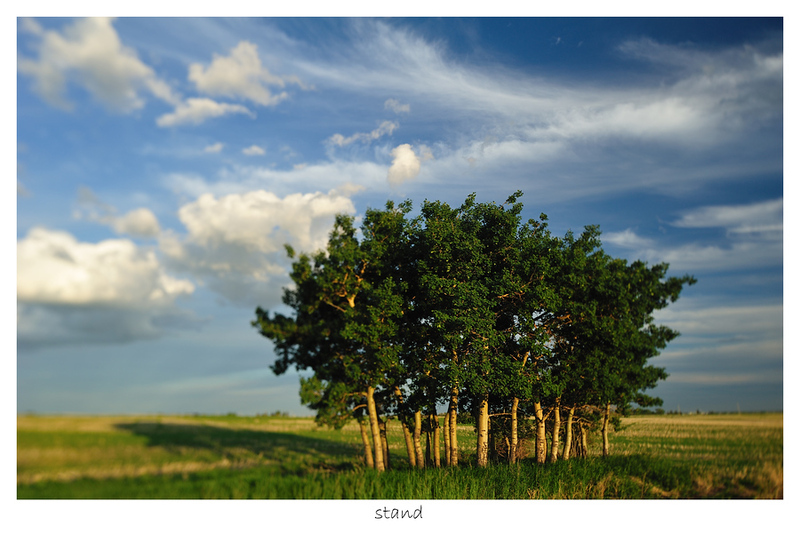 A stand of trees presented itself. Same kind of setup here tripod and mirror lockup. The prairie is pretty flat and I think you need to really search to find some interesting things to photograph. I drove around for a while until the sun was up far enough that the day had begun and all the drama of new light had moved on. I was looking for wildlife now - last week I saw an owl flying around and I didn't have a chance to photograph it. So secretly I was looking for owls. They are supposedly active 60-90 minutes before and after dawn and dusk. So I kept driving randomly long the township roads and eventually came across this fellow in a tree. Conor and I went skiing at Canada Olympic Park in the afternoon. They closed at five and have four hour rentals which worked out pretty good. It was busy though. After two hours we'd made a total of about four runs. The runs take about 4 minutes to get down the hill. The rest of the time was standing in the line waiting for the lift. While we were in line Conor said he had a headache so we decided to leave. We got some lunch which helped his head and he was feeling better. 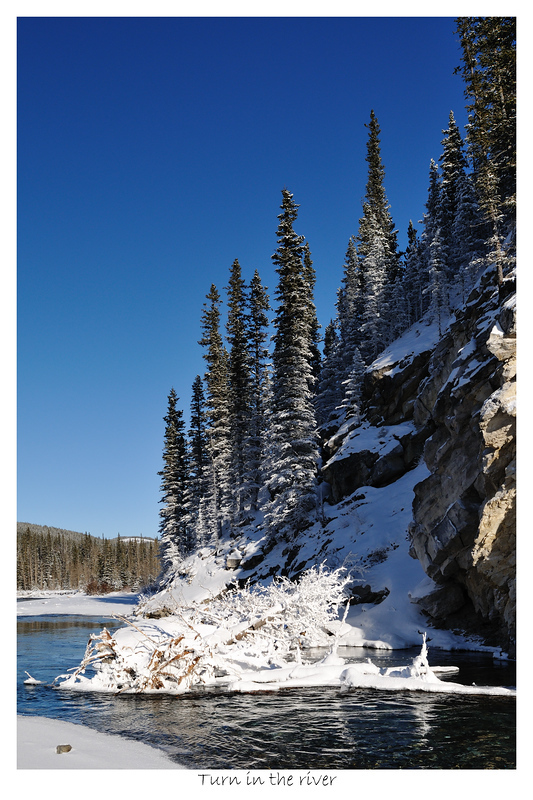 Because it was such a nice day and still early we drove out to Bragg Creek and walked on the Diamond T trail at Station Flats. 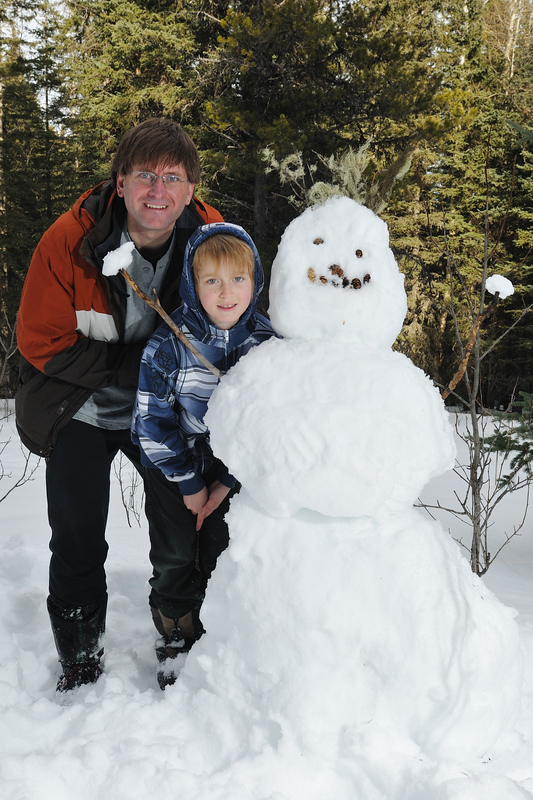 The hike was fun, I shot some photos of him and we had a few snowball fights and even made a snowman whom we named George.. Click on the picture below to see some other shots from our hike. 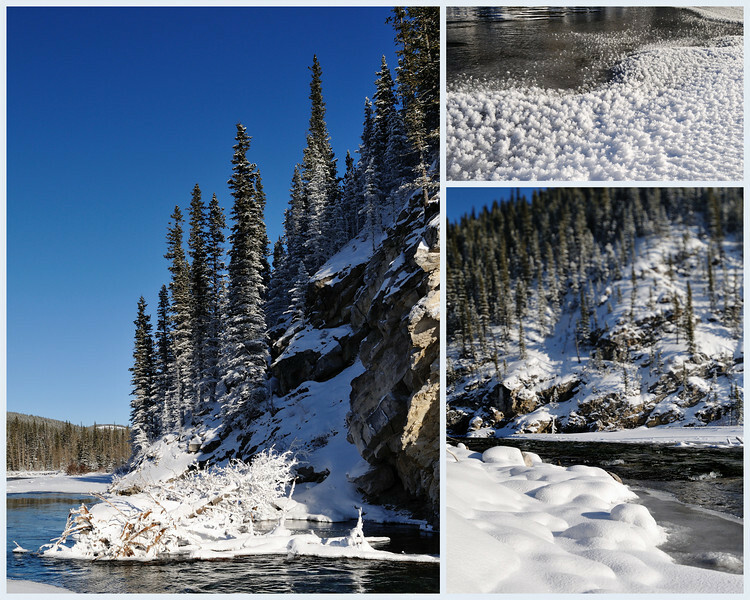 After we finished the hike I drove down to Elbow Falls and tried to take a few shots of the river. I was hoping to try out my ten stop filter again. I've posted two pictures, the first - "In Motion" was at 1/250th of a second and the water motion is frozen the second - "Flow" was a 20 second exposure. Both shots are from the same camera position and almost redundant but I like how both of them turned out individually. I hope you do too. Just for fun, here`s another shot of the river. After getting up and stumbling around a bit I noticed that the time on the TV/PVR said it was 7:30am.. it wasn't jiving because it still looked pretty dark outside. I checked my phone and it said it was 7:30 too. I looked at the weather app because it shows the sunrise time, and it said the sun was suppose to rise at 6:57am which confirmed what I thought. I'm standing on the deck in the back yard now and definitely can see that the sun has not risen. From the light it looks like could be a nice sunrise. I make my way downstairs and check on the computer and find out that today is daylight savings time (as I type this, I'm remembering that I need to check the clock on the camera and make sure it's in the right place..) So I decide I'm going to go out and take some photos of the sunrise. I grab my stuff and start driving out towards the city limits. I now had less than ten minutes before the actual sunrise so I wasn't going to go far. 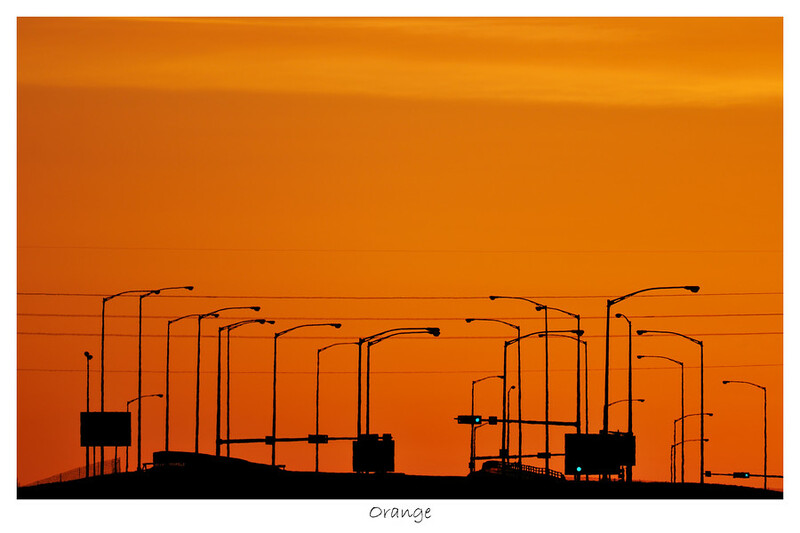 As I waited for the light at 68th and McKnight the sky was all orange and I made this shot. I like orange. It's one of my favorite colours. The lines are wavey because of atmospheric turbulence. I scaled down a copy of this one and made it my computer desktop wallpaper. I drove down the road and stopped by a field with some trees. In this next shot, I like the colour gradient that the light is making. I tried to hide the sun behind the tree so the brightness wouldn't overwhelm the image and black out the rest of it. In the next image I like how the sunlight is hitting the snow in the foreground. It didn't last long though the sun soon moved up behind some clouds and the light was muted. I setup for a more involved shot with the tilt-shift lens which let me get the foreground and background in focus but the light was flat and missing the playfulness that this image has. Something to take away for next time. I like that I can review images and see what works and use that to think about what I should be looking for when I'm in the field. I think it helps to try and pre-visualize what I might do differently next time. 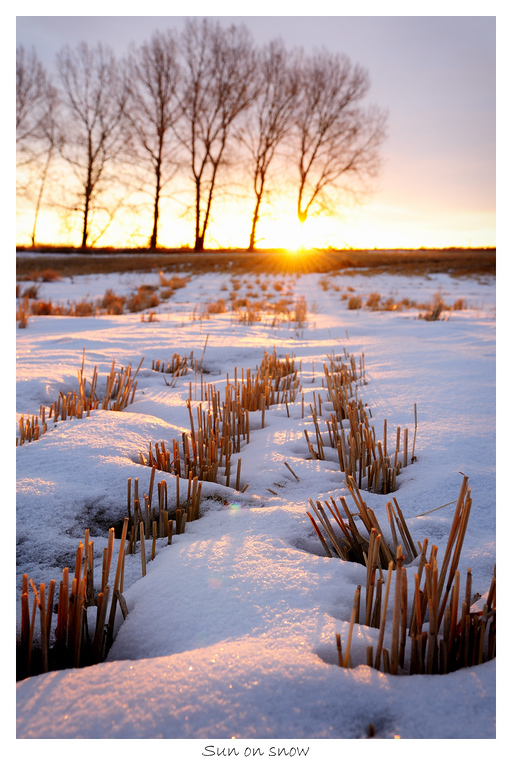 I had a few minutes and the sun was setting so I parked the car and made my way into the field. I liked how the trees looked against the sky which had some nice clouds rolling through. 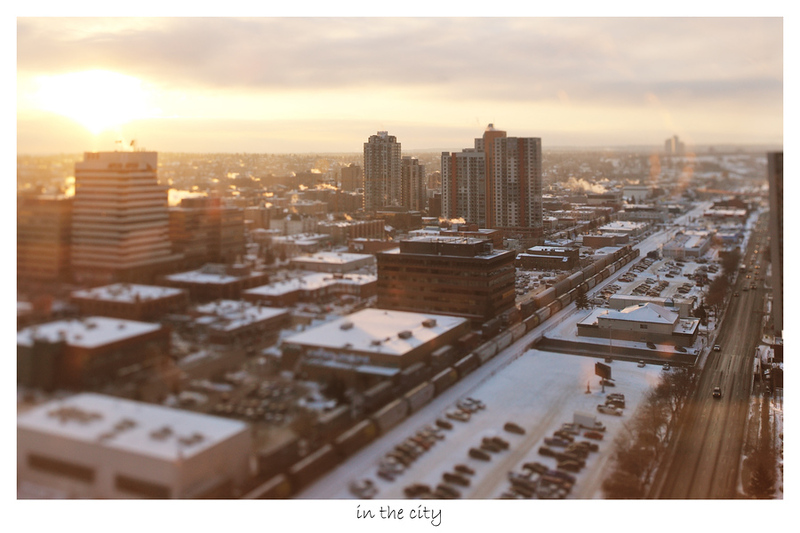 I used the tilt-shift lens to throw some of the frame out of focus. 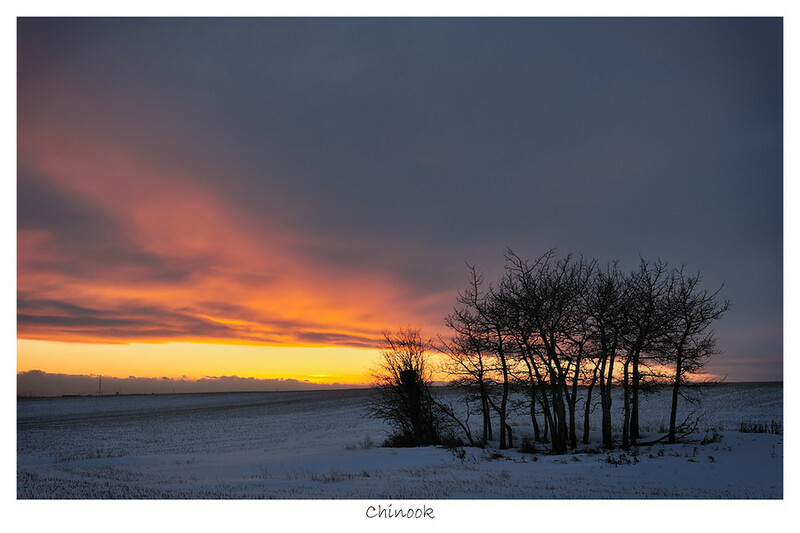 Driving home from work.. the sun entered the gap between the upper clouds of the Chinook arch and the lower bank of clouds. By the time I was at this location, parked, over the barbed wire fence, gear out, composition chosen, camera settings tweaked, the sun was down. I had missed it by a few minutes, but this is what I was able to get before the colours started to fade.. I was lucky to get to shoot my Nephew's hockey game - he wears number 15 in the white jersey. 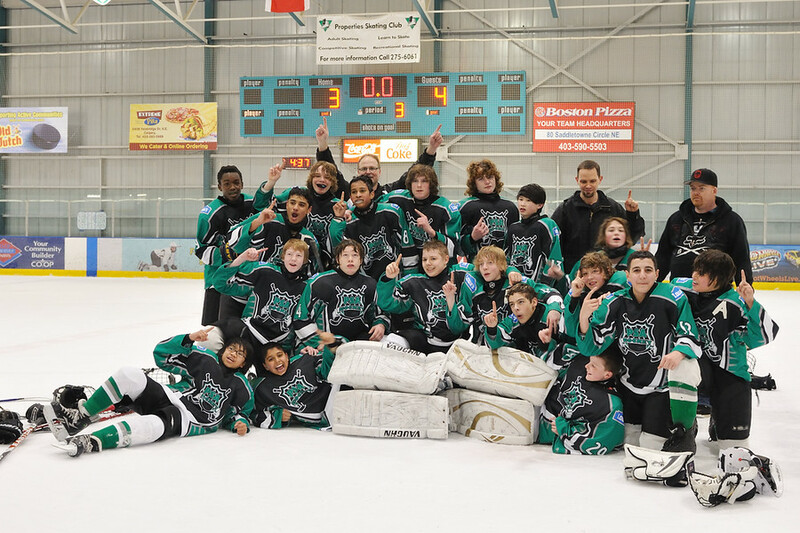 They were playing in a playoff match with the Trails West team at the Calgary Village Square leisure center. When I got there they had just taken to the ice. I was able to stand on the end of the players bench - which was a pretty good spot for this arena. The rink is surrounded by plexi-glass and topped with netting. If I wasn't on the bench I would have had to shoot through either of those obstacles, and I don't think anything would have turned out. The place was pretty dark from a photography perspective, I made most of the shots iso3200, f3.2 at 1/320th on my D300 using the 70-200mm lens, and still had to push the exposure in post processing. Click on the picture above to get to the photo gallery. 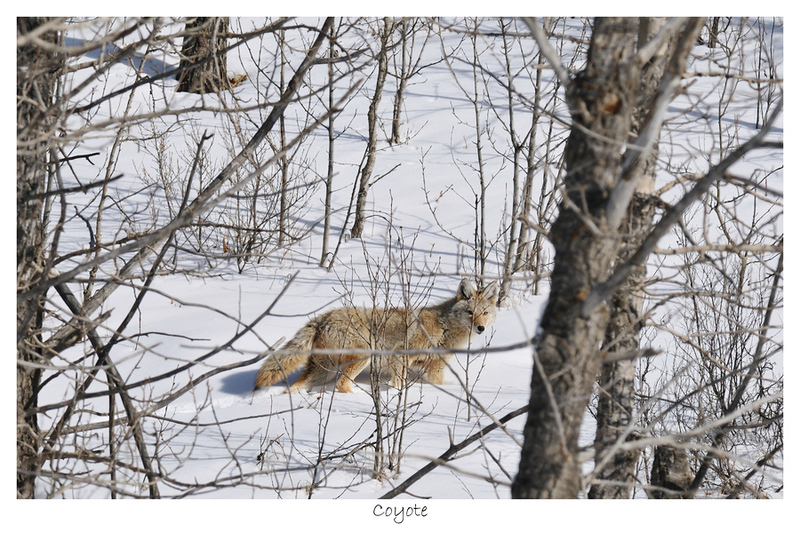 Took a short drive on some country roads and came across this coyote walking through the snow. I stopped and had to go into the back of the car to get the camera out and change the lens. He didn't flee while I was fiddling with my equipment so I was able to get a few shots. I like this shot because there is a small catch light in his eye. Afterwards I noticed how many of his tracks were all over the place. I had an urge to make a picture so I walked down near the river looking for something interesting after wolfing down my lunch.. for the most part it wasn't interesting. Cold, grey, blah, flat, featureless white on white. I walked closer to the rivers edge where there was a small ribbon of open water. Steam rising up into the cold air. 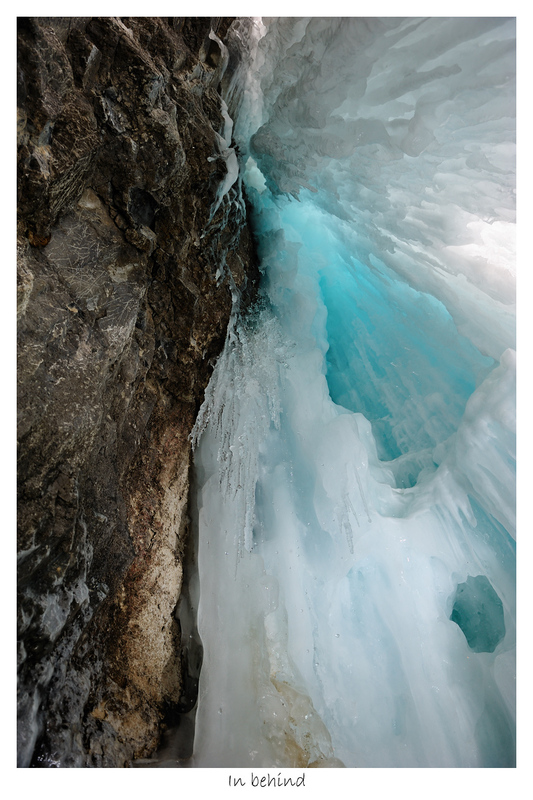 I could hear the chunks of ice bumping into the frozen edges as the water raced past. The steam might have been interesting, the sun was in the wrong spot I couldn`t get any reflections to bring out the texture of the water. I kept walking, ears starting to burn, hands tucked into my jacket sleave, the skin on my face feeling heavy and numb. Then I came across this tree. 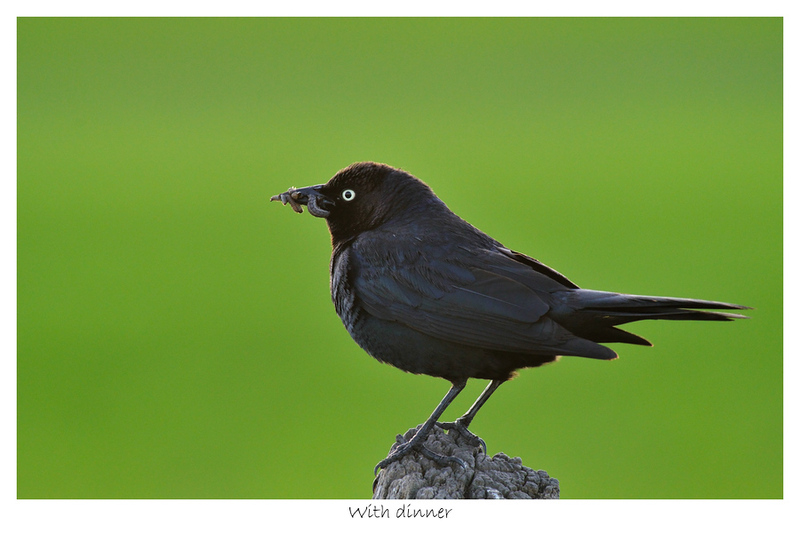 At first I noticed all the holes in it from where the birds pecked away to get at the bugs. I took a few shots looking for some composition. Then I noticed the huge branch lying on the ground, I took a few more. I thought I had it, my fingers were stiff from the cold, it was difficult to work the controls. I was walking away, trying to look through the moisture on the LCD in the bright light. Trying to see what I captured, see if I got anything. I didn't think that I had. I wanted to tilt the lens and make parts of the image out of focus, put emphasis on the tree, but for some reason I didn't do that. I went back and took a few more pictures, trying again. Fingers starting to go numb from holding the camera in the cold. I wanted to get it, so I'd shoot, review the shot - the tree's to high in the frame, adjust the composition, another shot, tweaking the focus this time. Couldn't feel my fingertips anymore. Think I got it. fingers hurt now.. time to go. I head back to the car, trotting along the frozen bike path. Later, processing the image, I like it. Trying to come up with a name. I looked up synonyms for separate, broken and apart.. Disjoined is what I came up with. The branch is disjoined from the tree. Later in the day, I tried to make a shot of the downtown skyline. This time I had gloves on, but I had to poke my fingers out to work the controls and they got pretty cold again. I think I've got to figure out a way to get circulation into my hands so they don't get so cold. Perhaps it's a sign of getting old. I'm not old though. I wanted this image to make you feel how cold it was but I'm not sure if it does. Maybe it's because the colours are too saturated. Perhaps cold shouldn't be so vibrant and colourful. There was another view that I thought would be interesting, but there was a fence in the way and some other obstacles that I couldn't overcome so I'll have to remember to try it out next time. I didn't have much time before I had to be back in town. 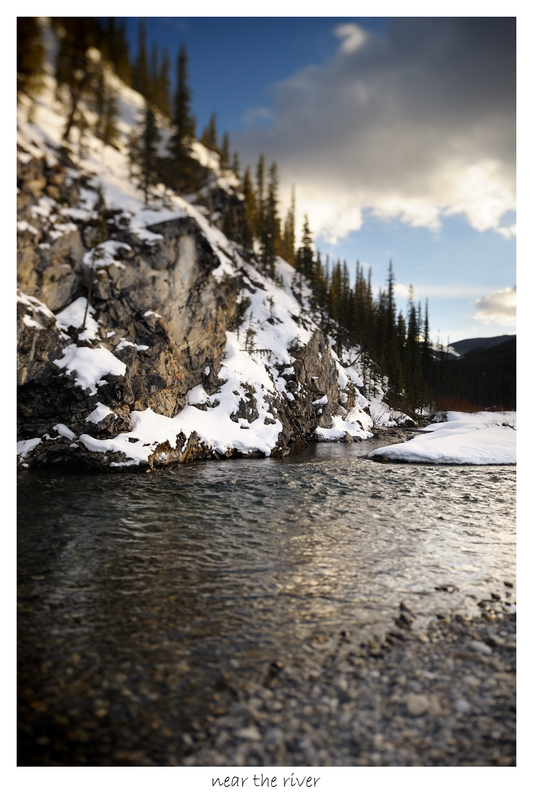 I drove out to the Bragg Creek area to see if I could make an image or two. It felt like it'd been so long since I'd held my camera in my hands. In my mind I wanted to find some water, the falls, the river, anything. I parked the car at the gate by Elbow falls and set the timer on my phone to go off after 30 minutes. This would give me time to get back to the car so I could leave. I had, at most, an hour to find an image. I put on my snow pants and boots and headed over towards Beaver Flats. The sun was out, the sky was a brilliant shade of blue. Shocking white snow from a recent snowfall. Cool crisp air. It was beautiful. 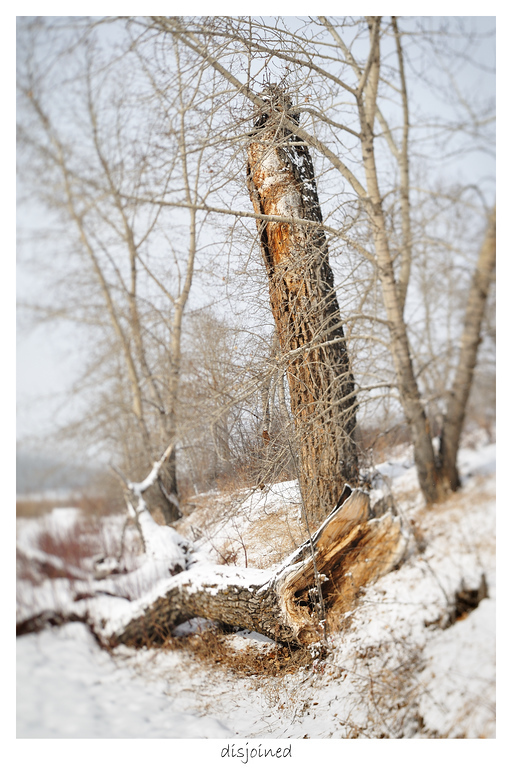 I walked down by the river and composed some shots - being careful not to make foot prints in the scene. I like how this one turned out. After a bit I walked a further down and found a blanket of snow covering the rocks along the riverbank.. like moguls on the ski hill. I was quite low to the ground, and trying to compose on the tripod.. sometimes it gets a little dicey being all hunched over like that. I'd knocked the camera and it caused the lens to tilt the focus plane. I decided to work with it, and like the effect here. Then the phone beeped at me, I reset the timer for another 15 minutes. 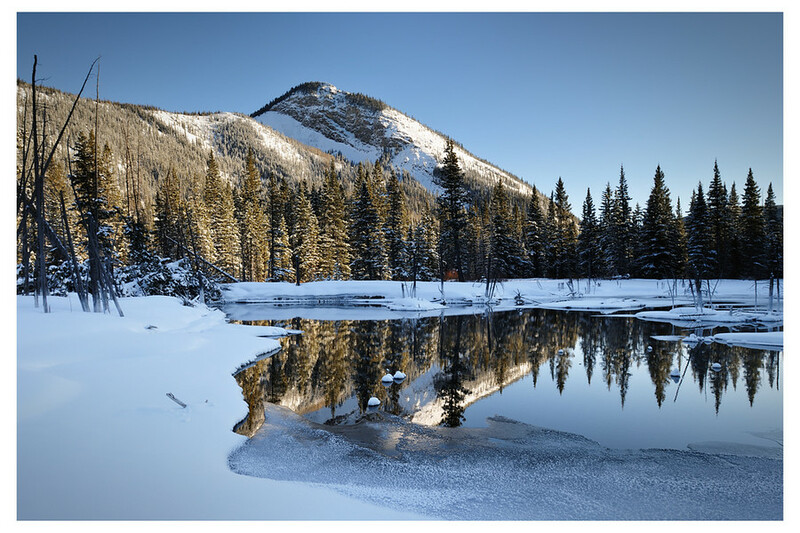 I walked over to the beaver pond and got pretty excited at the idea of the mountain and the calm open water. I wanted to take a panoramic image of the scene - three shots merged into one to show a wider than normal view. I like how sharp I was able to get the image. However, I'm not too happy with the composition - or the view. It feels too.. normal, and kind of boring. I think I got caught up in trying to get the focus and the panorama shot that I didn't pay enough attention to the rest of the details that could have made this a really great image. What do you think about this picture..
All of a sudden, it was time to go. I packed up and made it back to the car with about four minutes to spare on my self imposed deadline. I was drove back into town in about 45 minutes. The quick escape was good, for a while I felt refreshed. 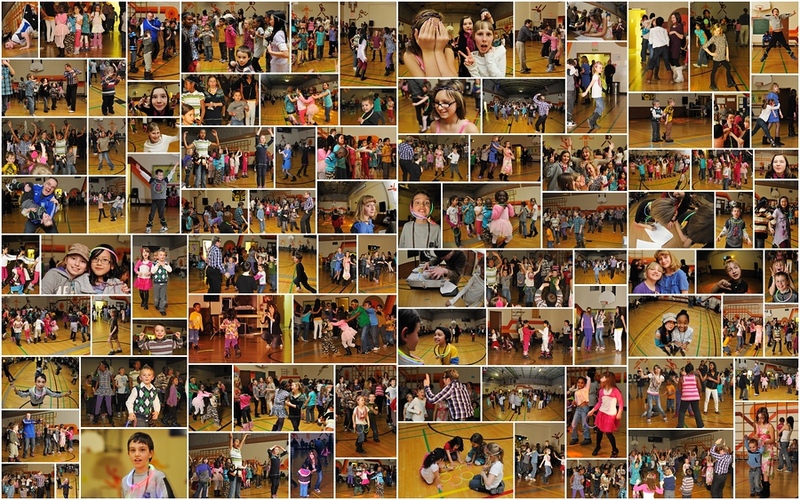 Went to the school for the annual spring dance. It was fun, I enjoyed wondering around taking pictures. Everyone seemed to have a good time. Click on the picture to see the gallery. 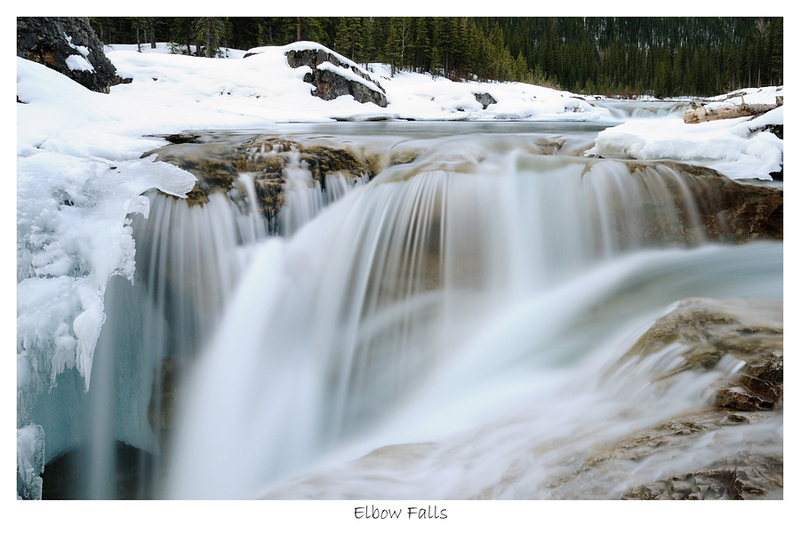 Really fast trip out to Elbow falls to get this image. Drive there, take the picture, drive home. ok I took two or three pictures.. maybe 5.. yeah, I`m sure I didn`t take more than 25 shots. But they were quick shots. I'd picked up a filter which is essentially a piece of black glass that you put in front of the lens. I was anxious to try it out. When you put it on the camera you need to add 10 stops to let the same amount of light through. One use for it is to do what I've done here - make the water all smooth and glassy. The exposure without the filter was at 1/250th of a second. With the filter the exposure became 6 seconds. What I wasn`t expecting was that the colour balance would go all blue like this. Overall, I like it and the effect. 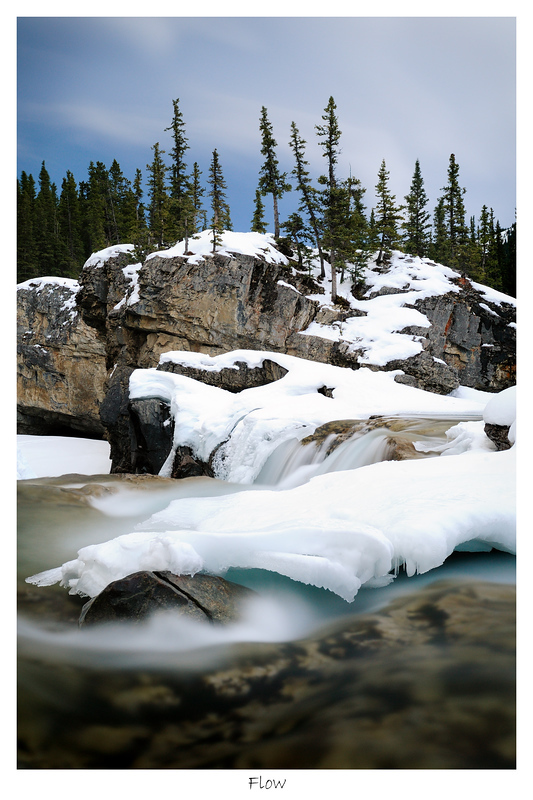 I`m looking forward to using the filter for making some creative images once all this ice melts off and we get lots of water flowing. I suspect with all the snow we've had this winter that the creeks and streams will flow nicely this spring. At lunch today I walked down 9th Avenue looking for something to shoot. It was pretty cold outside I had a toque and gloves on but my exposed face became quite cold and numb. I walked east and after a while I thought I should turn north towards the river. With the cold that there might be steam rising up from it which would make for an interesting shot but I didn`t make it that far. I got to about Center street and 4th Ave before walking past the Bow and finding this view. 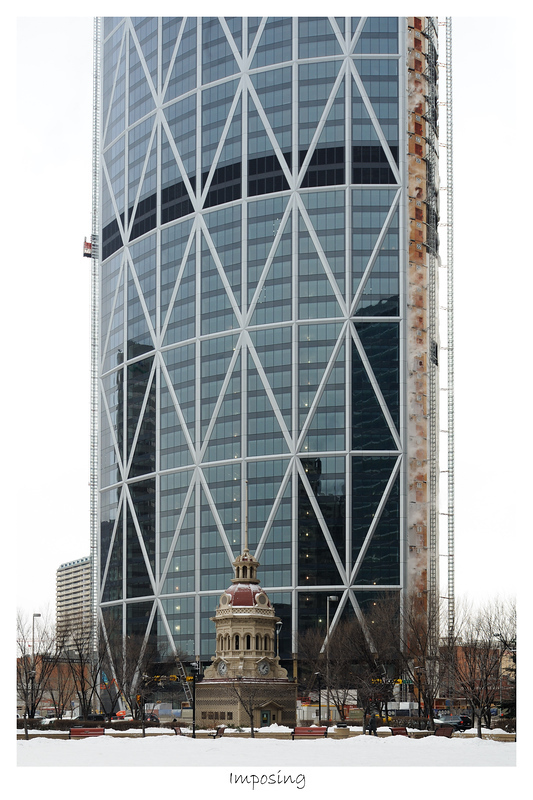 I`ve mentioned before that I have quite a few pictures of the Bow, many taken from my car as I drive to and from work. I hadn`t seen it from this vantage point before so I tried to make a shot. I like how the Bow comes across as such a massive structure compared to all the other elements in the picture. This next image I made later in the afternoon from the window an empty office on my floor at work. I noticed that the sun was starting to set and ventured down the hallway with camera in hand. It was still pretty cold outside and the steam coming up from all the buildings was catching the light as it came in at a low angle. When I was lining this shot up the sunlight was hitting me and reflecting my image back on the window. I didn't want this in the picture so I looked around for a solution. There was an empty garbage in the office with a black garbage bag in it. I took the bag and ripped a small hole in it so I could look through the viewfinder of the camera. 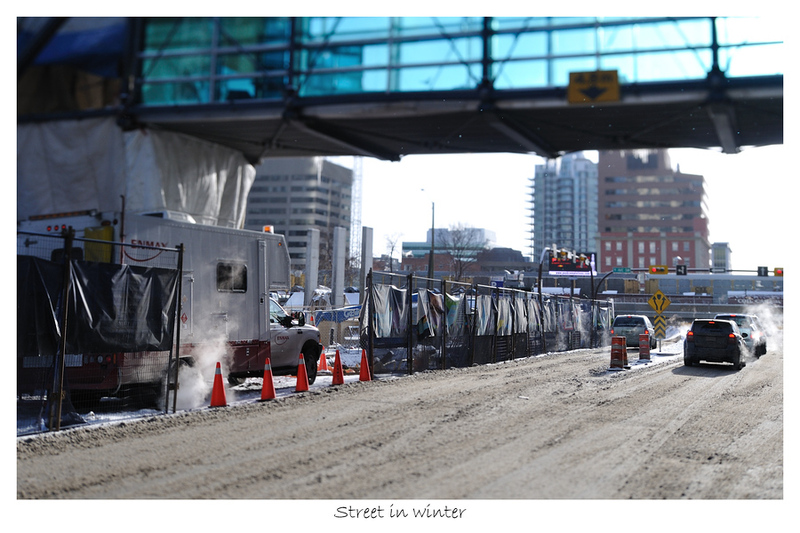 I then put the bag over my head and took the shot from within the garbage bag. You can see the sun reflecting off garbage bag in the picture but I don't find that it's intrusive to the photo. I'm sure I looked pretty funny huddled next to the window inside of a garbage bag, luckily I had closed the door and no one saw me. It quickly became warm in the bag so I didn`t stay in there very long. 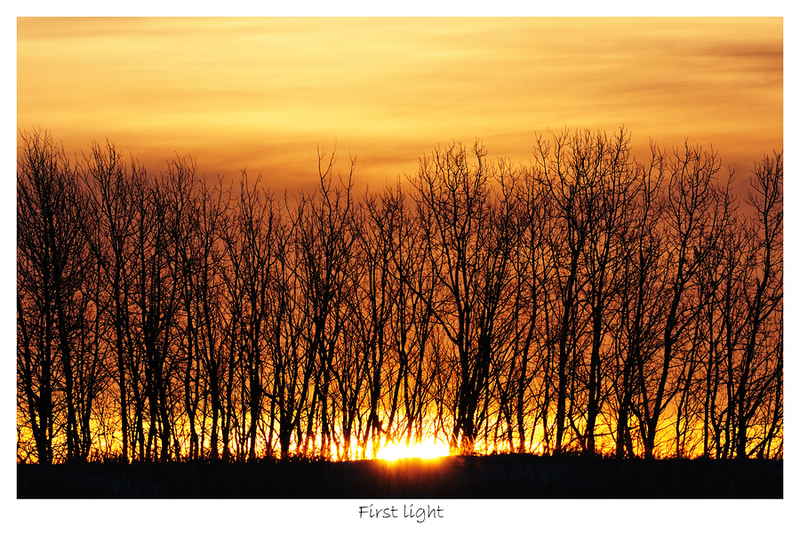 The winter light can be bright and blinding because the sun is so low on the horizon. I was walking around at lunch, and liked how the light was hitting the street. I took a picture here but I don't really think that I captured the essence of what I felt here. I think the emotional hit of seeing the sun was influencing my mental capacity because it's almost always dark when I'm outside and it had been grey and overcast for a long time. Seeing actual sunlight was a shock to the system. Conor and I went Bowling on Sunday afternoon. We were sitting around the house for most of the day. The girls went out shopping so we went over to Deerfoot mall to bowl a few games. At first we didn't have the gutter rails up, and for the first five frames Conor had only hit two pins and was getting a little frustrated. He went and got them to raise the rails and after that his bowling improved quite a bit. In the third and final game, he was leading 135 to 95 as I entered the last frame of the game. I told him I was going to get three strikes in a row. I don't think he believed me when I said it. I threw the first ball and got a strike. As I walked back to pickup the second ball, I was waving two fingers at him saying "strike number two coming up". He laughed, I rolled the ball down the lane and got another strike. I whipped my head around and looked back at him with a smirk on my face. His eyes were wide. One more strike, and I'd win, the score was 135-125. I threw the last ball. Hit the 2 pin. Conor won the game 135-127. After bowling I was getting anxious to make some pictures and thought there would be some opportunities at the zoo. Conor agreed to go so we drove over and got there around 3:30pm. It was pretty much empty given the cold and wind and the lateness of the day. We walked through the Africa Exhibit and saw the hippo's then into the gorilla house. From there I wanted to go to the butterfly house. There weren't any butterflies and not really any flowers to speak of. It use to be that the atrium had a lot of flowers and things to photograph but since they rebuilt it - it hasn't been the same. Maybe it needs more time to evolve. 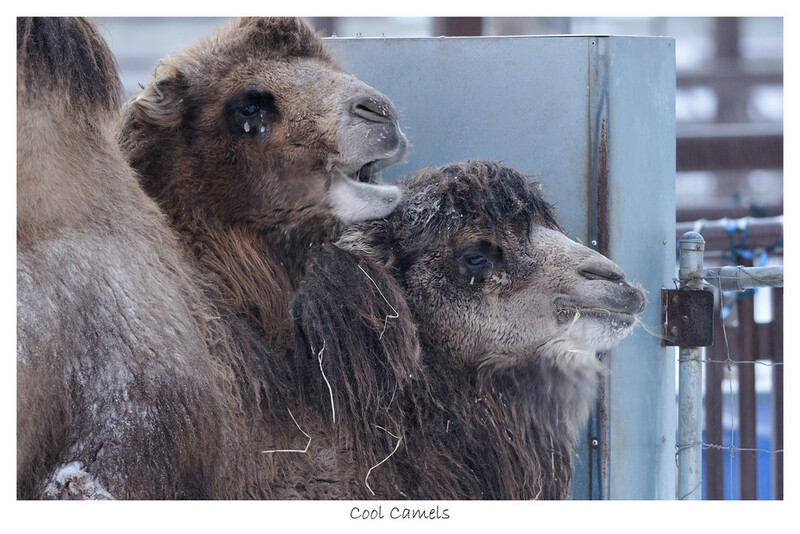 We walked over towards the tiger cage and came across the camels who were outside eating. I tried to grab a few shots but it wasn't long before it was too cold and we decided to leave rather than go look at the tigers.